She looks like she's contemplating the approaching winter. Your cat looks like a twin to the cat we adopted from the Humane Society yesterday!! I have pics on my blog if you want to see. Thank you for the kitty pic, FG! Patchy Cat is one of my favorites. 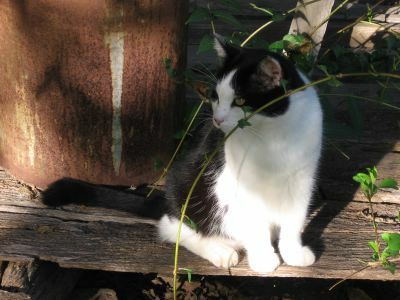 Patchy cat looks so much like our first cat Jack, thankyou for yet another gorgeous photograph. I'm way behind answering questions and replying to comments and emails (I know, I know, tell you something you don't know, LOL). I'm hoping to catch up bit by bit over the next few days. Thanks for your patience. Patchy Cat is one amazing fellow. He really is the Farm Boss. Everywhere you turn, there he is! Welcome to the farm! For reasons of privacy, the only information I share regarding our location is that we are in the southern part of Missouri. As for emailing me, you are more than welcome to (as is anyone else). My email address (which can always be found on my Blogger profile page--get there by clicking on the link that says VIEW MY COMPLETE PROFILE at the bottom of the ABOUT ME paragraph in the sidebar) is farmgirlfare AT gmail DOT com. oh, how sweet, I love cats too! I had a boy kitty named Alex, a long haired orange and white tabby-very petite and everyone would always say "she" was so pretty :) Our vet used to say "he's a special kind of cat", oh my he was a handful, it was either his way or the highway! Of course it was always HIS way - for 18 wonderful years. Oh, it was your 'last BLT' entry that caused me to slam together a BLT (though I'm sure inferior to your home-grown tomato and fab bacon and home baked bread) and eat it standing at the counter!